Denizens of Japan can’t overlook the soft toy bear, Rilakkuma, and his friend–the white bear cub, Korilakkuma. First appearing in the picture book, Rilakkuma Seikatsu, which tells the story of a toy bear who takes up residence in the apartment of an Office Lady, Rilakkuma has since become a mainstay plush toy and beloved character, appearing on cameras, stamps, and furniture; and even starring in his own videogames on the Nintendo DS. Now, If you were actually expecting ugly Korillakuma and Rilakkuma goods, this article is going to disappoint you! Let’s face it, is it possible for this squishy and pudgy bear to NOT be cute? From the palm-sized Rilakkuma plushie, to the five-foot-four-inch tall giant Rilakkuma plushie, there’s a soft, cuddly bear for every occasion that you need to add a little “kawaii” to your room, office, or home. Not only that, but Rilakkuma and friends also come in a variety of plushie customizations to suit your preferences—from Rilakkuma in his fuzzy bunny suit, to Rilakkuma eating a stack of his favorite pancakes. …But if you want to cover your cellphone in all things Rilakkuma, then you can’t go wrong with these adorable cases, specially tailored to fit everything from the iPhone 5 and beyond. Ranging from firm, plastic patterns and bear faces, to plush, bear-eared hoodies, the customization options cater to your individual personality and preferences. Give your photography a Rilakkuma makeover with these limited-edition cameras. While several lines of bear-themed cameras have been released in Japan, the Pentax Rilakkuma Camera (limited to 1,000 pieces world-wide) and the Fujifilm Instax Mini 25 Instant Film Camera (also released in a small, numbered quantity) are considered the most highly-sought of them all. While the Pentax is a digital camera, the Instax Mini produces high-quality, credit card-sized instant prints for your convenience—perfect for creative art projects, Cons, and other fun events that you love. Eat your lunch and other meals in true, Japanese-cuisine fashion. Whether you enjoy arranging your food into artistic kyaraben, or just appreciate a bit of authenticity with your rice, meat, and vegetables, these Rilakkuma bento goods are sure to sweeten your future eatery experiences. If your obsession with Rilakkuma leads to a full-house makeover, then it won’t be complete without this bear-themed furniture. 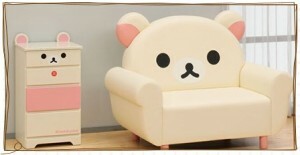 Purchase the Korilakkuma chair and chest to instantly add the right amount of plush comfort and storage space to any room. With four separate compartments, the Korilakkuma Chest has enough space to hold for all your mementos and other treasures, and its top shelf leaves plenty of room for you to display your favorite Rilakkuma plushies and merchandise. Decorate your letters, notebooks, wallpaper, and so much more with these woodblock, rubber stamps. Featuring Rilakkuma, Korilakkuma, and their yellow chick friend, Kiiroitori, these stamps are tailored for any occasion—be that the Year of the Ram or a simple “hello” greeting. For $40, you can commission a one-of-a-kind stamp, featuring one of eight different designs, along with your personal mailing address. This special line of Deco merchandise combines the charm of Rilakkuma with the glamor of Swarovski crystals to bring you everything from stickers to crystal compact mirrors. Bejewel your iPhone with a Korilakkuma case, tote your iPhone wherever you go with a Rilakkuma crystal dock strap, keep your cosmetics in check with an un-bear-ably cute crystal compact mirror, or decorate your cellphone, laptop, Nintendo 3DS, or headphones with your favorite Swarovski crystal character. Nothing keeps your feet warm like the gentle fur of Rilakkuma and Korilakkuma. When cold winter days or long, dark nights make your shiver, just slip on a pair of these cuddly bear slippers to keep the chills at bay. With a variety of bear-themed slippers at your choosing, you are free to pick whatever is most comfortable on your own feet. Each slipper is crafted with special attention to Rilakkuma lore, with the interior of the Rilakkuma slippers featuring his traditional, blue, polka-dotted pattern; and many slippers showcasing both bears’ collection of adorable outfits (such as their furry Neko costumes). If you love Rilakkuma and his furry (and feathered) friends, then it’s high time you dove into the treasure trove of exclusive merchandise that Japan has to offer. Whether you collect iPhone cases, plushies, stamps, bento, cameras, or furniture; or simply enjoy the eccentrics of character-themed merchandise, Rilakkuma and Korilakkuma have something special in store for you. 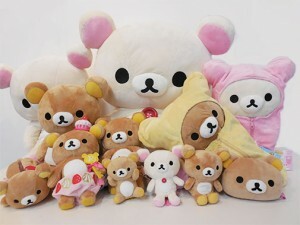 These adorable bears are immensely popular, and this list of must-have merchandise is far from all-encompassing, so be sure to check out even more Rilakkuma memorabilia at the FROM JAPAN online store!